From time-to-time regulations change, so it is important to keep updated. Become familiar with species commonly caught in Virginia / North Carolina waters so that regulations can be properly applied. Don’t take up to your bag limit of fish just because it is legal to do so. If you’ve already got more fish than you know you will eat, let the others go when you catch them. Studies have shown that many released fish survive to be caught another day. This goes for by-catch – what many people call trash fish – too. Many non-targeted species serve as a food source for other fish. No matter how tempting, it’s a waste of fish. High-grading is when you take a previously-caught legal sized fish out of the hold and discard it so that you can keep another, bigger and still remain within the bag limit. 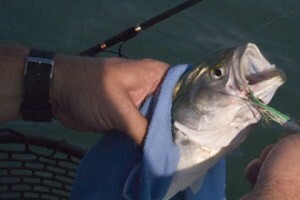 Use a soft, wet towel to hold the fish. This protects the fish and protects your hand from the sharp dorsal fin. Keep the fish out of water for as little time as possible and handle it as little as possible. Prevent the fish from thrashing around and hurting itself by confidently, but gently gripping its body, keeping your fingers away from the gills. Use a pair of long-nose pliers to grip the middle of the bend of the hook and gently pull the hook free. Do not try to twist the hook free. If the barb has gone through the fish’s mouth, cut it off and pull the remainder of the hook free. If the fish has swallowed the hook, cut the fishing line. Sometimes a fish can survive with a hook inside its stomach. Use circle hooks to help prevent the fish from swallowing the hook. Report any tagged fish you catch and cooperate with authorities conducting surveys. Attend public meetings related to marine fisheries issues. Never throw trash, like plastic six-pack drink yolks or fishing line, overboard or dump pollutants such as gasoline and oil into the water. Damaging the water damages the fish.